18k gold custom made solitaire ring consisting of princess shape, natural diamond, weighing 1.52 carats, having a G color and SI1 clarity, according to GIA grading scale. 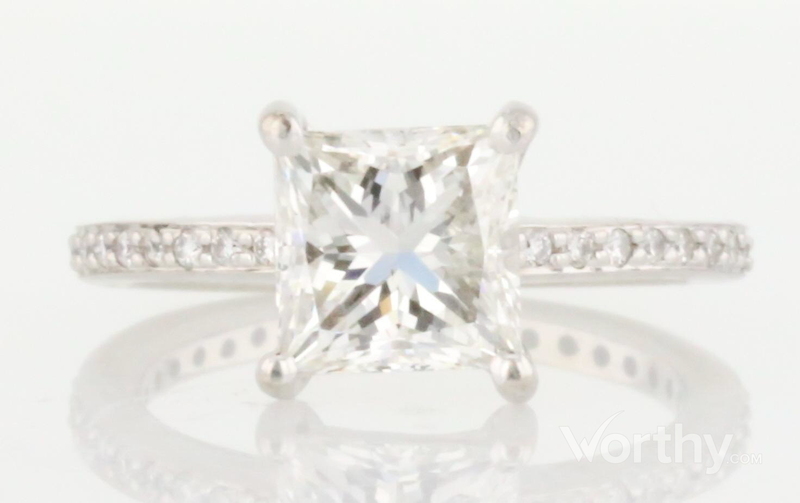 The center stone measuring 6.40mm x 6.39mm x 4.56mm and carries a GIA grading report, No. : 16293707. All surrounding diamonds are genuine with a total carat weight (cttw) of 0.12 carats. Inclusion Description: The grade making inclusions are: several small dark feathers running perpendicular to the table located inside the table just under the surface, and several very small crystals located near the feathers. Blemishes Description: Minor abrasions along the girdle. The girdle is slightly thick to thick. GIA number is laser inscribed on the girdle, however does not contain the GIA logo, nor is it stated on the GIA report. LXS laser inscription is Elexese.